It’s time to start a new Mystery Class! Today was the first lesson of the Owl with Key by Sandra Vargas. We love her style and this canvas is no exception. 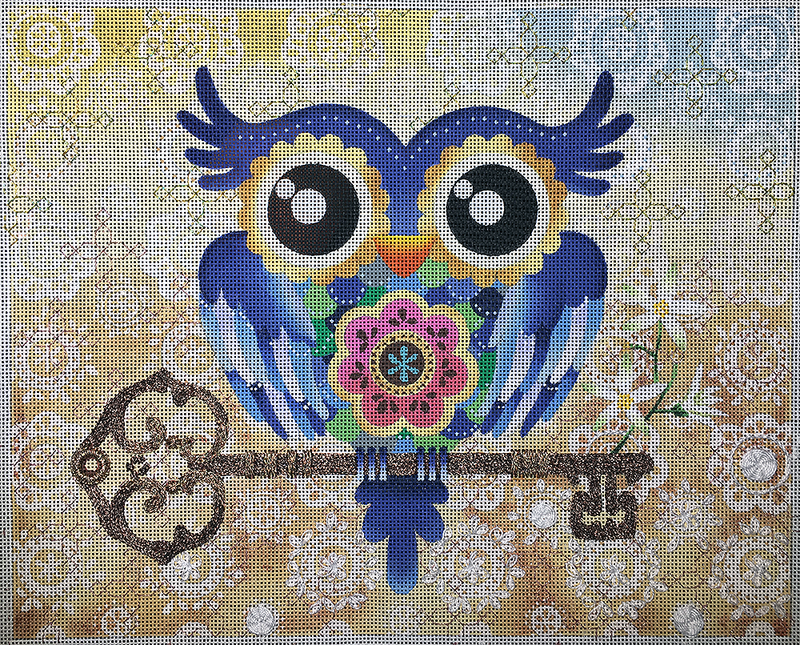 Big beautiful eyes draw you in and that flower on the owl’s tummy! What will we do with that? I do like to keep you guessing what I will do with a canvas but by now you know, lesson one is more than likely the background. 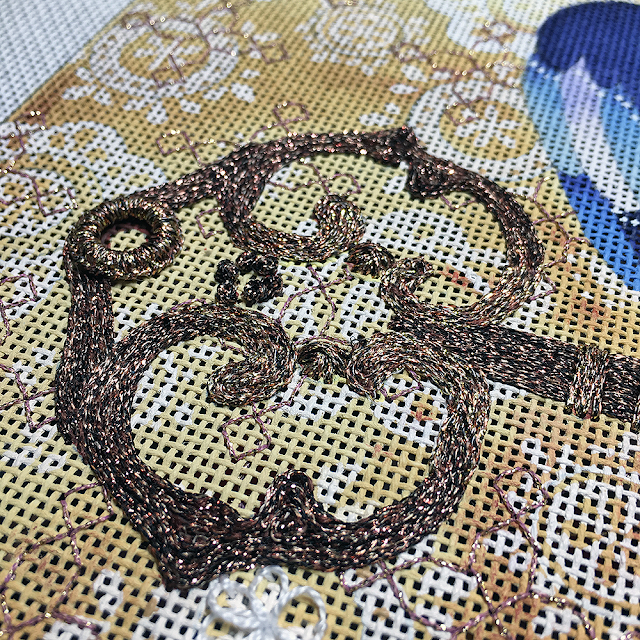 I like the lacy look of the painted background and wanted to create the illusion of lace without it getting too heavy. Soooooo….. Step one is a nice light sparkly pattern. Step two is all freeform embroidery. I’m not finished with the background yet. I will embellish more of the painted lace but this gives you the idea. You can do as much or as little as you like. It’s kind of like eating popcorn. You just keep going. Next up is the key. 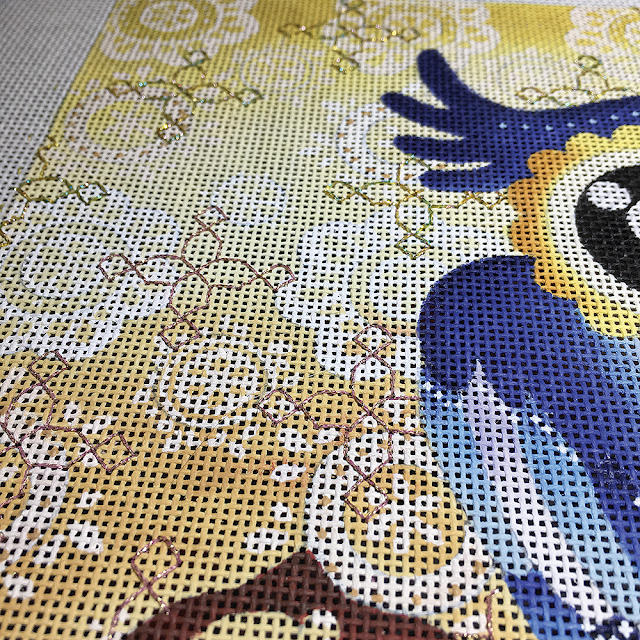 I needed to stitch that next so that the owl would have a place to sit. 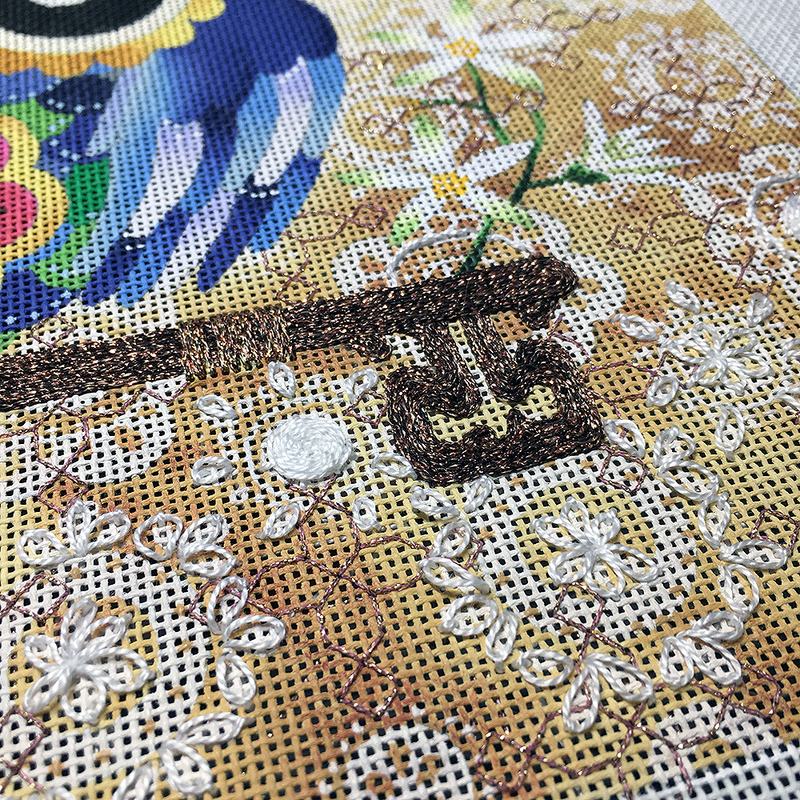 Mine is stitched entirely in Inline Couching. You could also Tent Stitch it. The idea is that it should be smooth and show off the curves. You know I love go withs. They make me happy. 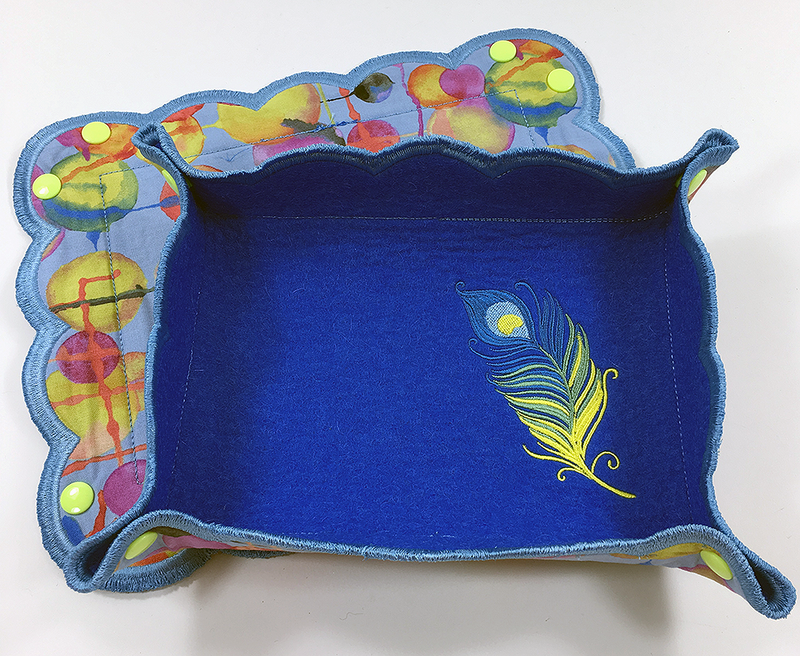 Our new snap tray may just be the prettiest one yet. We have a few not spoken for so if you want us to add one to your package give us a call or email us. And just look at the fat little owl magnet everyone is getting with their class kit! 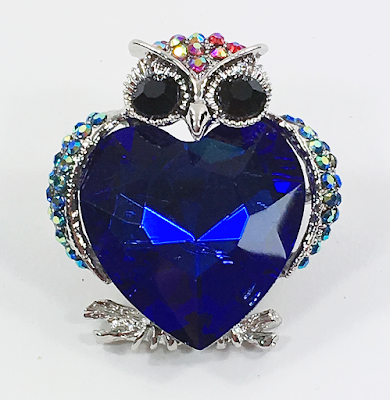 Too cute and so sparkly! Next lesson is in two weeks! I guess the owl is next 🙂 We do have extra canvases in stock so if I have just tempted you, give us a call at 410.296.0405 or order online and we can send goodies your way. Mary Legallet is here next weekend for two fun filled classes. Kits will be available if you aren’t joining us in person. The fifth lesson of Why Fit In has finally shipped! If you don’t have yours yet, give us a call. I’m working on the next lesson of Row of Ladies II and will have the girls back on track asap! Lots going on. Wow wonderful way to address this tricky canvas. The lightness is impressive, yet adds dimension, interest, and life! Don't know how you come up with these ideas! Row of Ladies? It's been a YEAR since the last lesson! 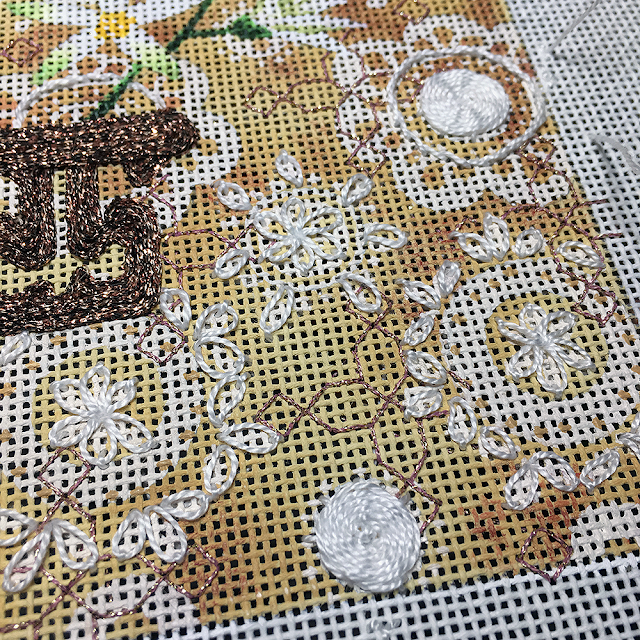 Maybe you could do the stitch guide for the rest of the ladies and be done with it?